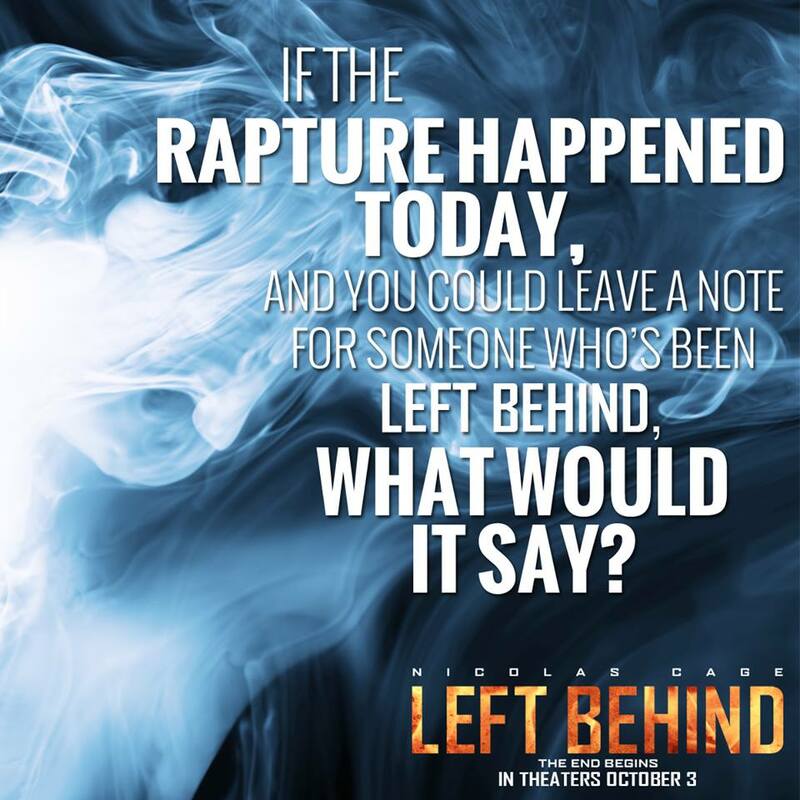 With the upcoming release of “Left Behind” I have been thinking about this. They have been posting little tidbits about the movie and book series. Of which I love the book series and own them all. I have also watched all the movies that have Kirk Cameron in them. But the question that they pose is pretty simple, but hard. 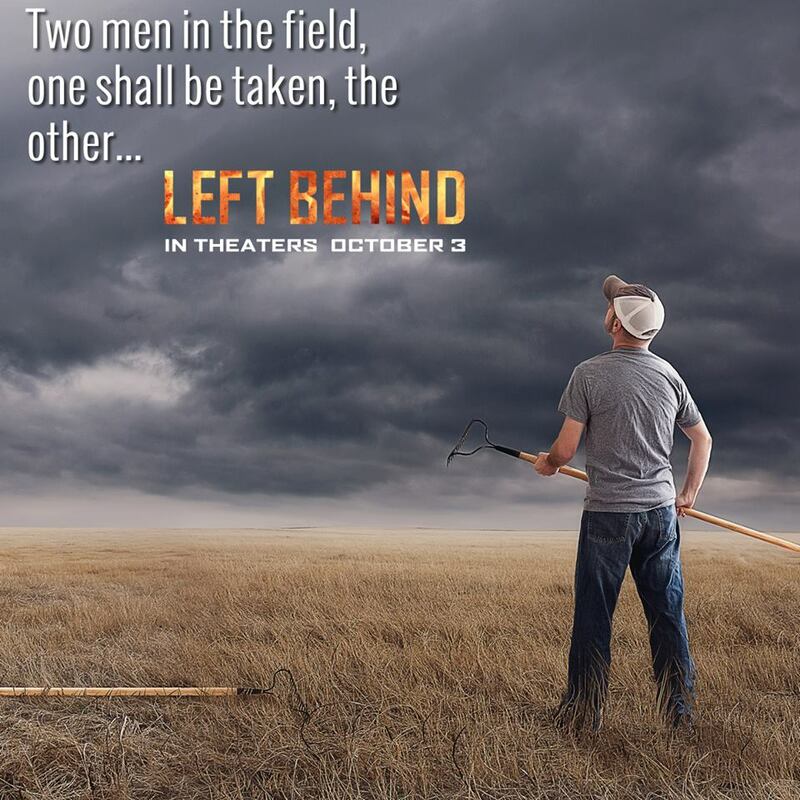 What message would you want those who are left behind know about? For those who don’t know anything about this movie or book series. It is about the end times. Nickolas Cage will be playing the main roll in it. For many Christians, they believe that Christ will take his church home before the tribulation period begins. The rapture will take place sometime in the near future. Jesus will come in the air, catch up the Church from the earth, and then return to heaven with the Church. The Apostle Paul gave a clear description of the rapture event in his letters to the Thessalonians and Corinthians. “Behold, I shew you a mystery; We shall not all sleep, but we shall all be changed, In a moment, in the twinkling of an eye, at the last trump: for the trumpet shall sound, and the dead shall be raised incorruptible, and we shall be changed. For this corruptible must put on in-corruption, and this mortal [must] put on immortality” (1 Cor. 15:51-53). When I think of the end times, I have mixed emotions. The reason I say that is because I am looking forward to the second coming of Christ. But at the same time it is a time of sadness because of those who won’t be with Christ that I love. Each person has to decide for themselves, I can’t make them. The Bible is very clear on how terrible things will be. There are many theories out there about when Christ will come again. Never trust anyone who says they know, because it isn’t true. 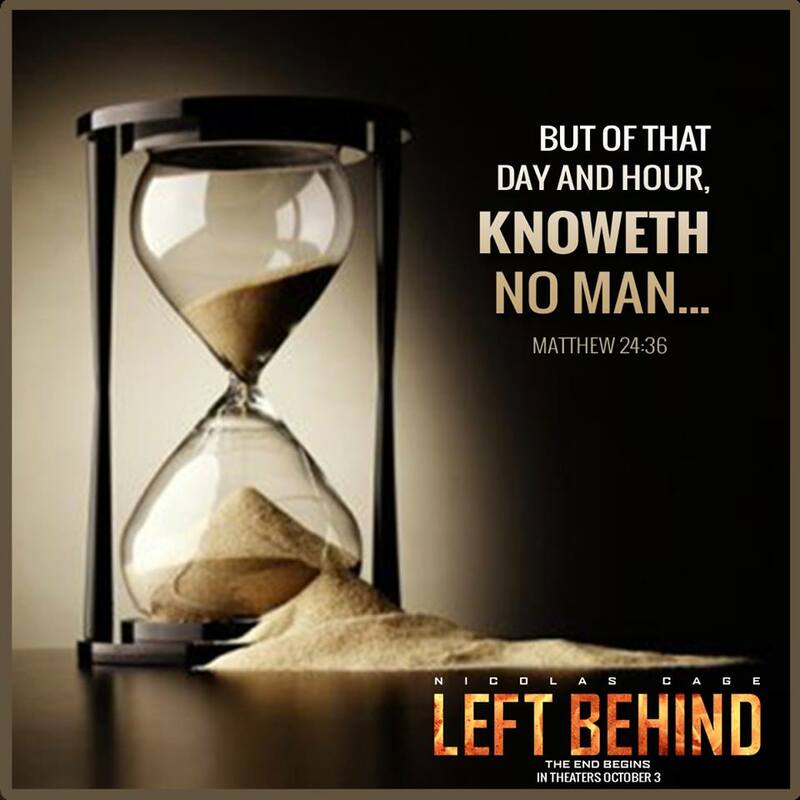 We are given signs of the end times, but no year, month, day or hour. If anyone is reading this and the rapture has happened, help yourself to the books, bibles and other resource I have, because you will need them. I do hope that it is the pre-trib theory. The reason I say that is because I am a chicken and no way would I want to have to even think about having to live through the mid tribulation period or any other kind of tribulation period. It doesn’t matter if it’s pre, mid or post tribulation – what matters is it’s real. It’s coming and it’s close. For those who know the Lord personally, does it matter if it is the pre-trib, mid-trib or post-trib. We should be doing the Lords work each day. As things begin to unfold in the world, we will know. God knows when things will happen, we just need to be ready and talk to as many as we can about who God is and what His plan of Salvation is. We should all be reaching out to the LOST, and try, in any way…to reach them, with God’s Good News! ” 15 The second beast was given power to give breath to the image of the first beast, so that the image could speak and cause all who refused to worship the image to be killed. 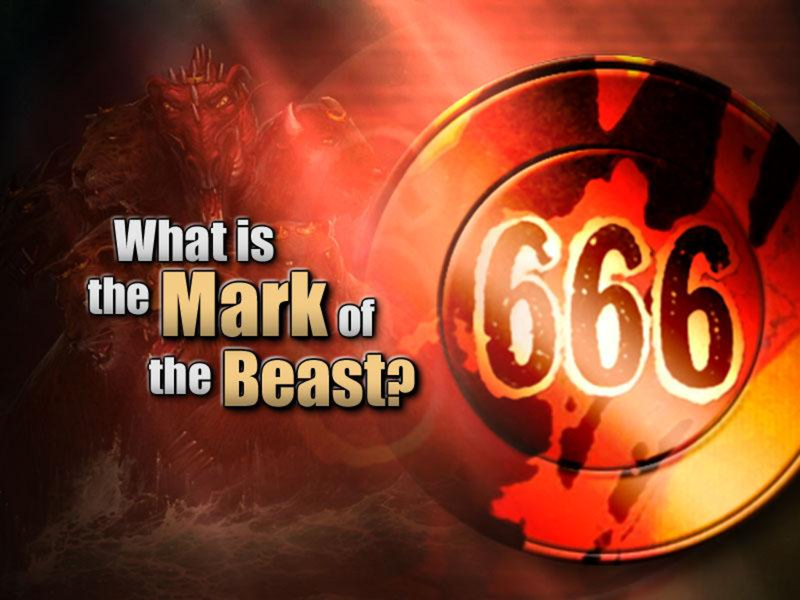 16 It also forced all people, great and small, rich and poor, free and slave, to receive a mark on their right hands or on their foreheads, 17 so that they could not buy or sell unless they had the mark, which is the name of the beast or the number of its name. Secondly, I would say to read the Bible and hide out. Things are not going to be pretty. The Anti Christ will lie to you and most that will be saved during this time will have to find a safe place. Don’t trust anyone and be on guard. I would guess that most who are saved during this time will be killed for their faith. It is better to loose your temporary life then to loose your life forever. As believers in Christ we must realize that this world is not our home! Also during this time, you will find it almost impossible to be able to buy food, gas or just about anything. The only way you will be able to do anything is if you have the mark of the beast. That mark could be almost anything. Now, my thoughts is that it will be a micro-chip of sorts since they can be read easily. Don’t do it. It isn’t worth it!!! Lastly, I would say memorize the Word of God and pray. Don’t believe people when they try to convince you that everyone that is gone was abducted by aliens. The only thing that is true about aliens is that as Christians we are aliens in a sense in the world, since we live in the world, but not of this world. Jesus Christ said, In Matthew 24:40 it says “Then shall two be in the field; the one shall be taken, and the other left”. No matter when Christ comes, we know for certain that He will be coming again. We know we must be ready and sharing the Word of God. There are many nay sayers and those who believe that this is fiction. Hopefully those who are the nay sayers will accept Jesus Christ as their Lord and Savior before it is too late and guarantee ya, that if you take the mark, then it is too late. 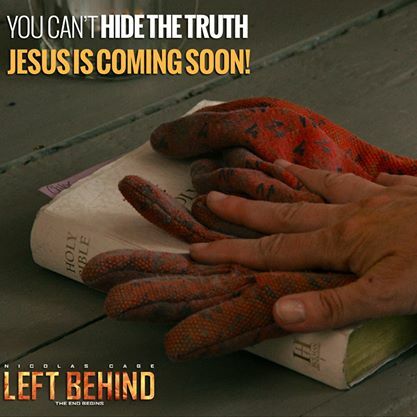 Most of the images on this blog posting are from the Left Behind website. They are owned by them. Next Sick of the Media and Al Sharpton?